I support connecting Caltrain and SamTrans to the new ferry service in South San Francisco. The public subsidy is currently estimated at $266 for every round trip and ridership is dropping. After three months, ridership on the highly subsidized ferry service between South San Francisco and the East Bay is drawing only about a third of the weekday passengers predicted. What's more, ridership on the new service appears to be dropping, falling by almost 500 trips last month. The line's 140-seat ferry boats are averaging about 20 passengers a trip - about one-seventh of their capacity. The Water Emergency Transportation Authority, which oversees the service, had estimated 100,000 annual riders - which works out to a public subsidy of $47 per ride, or $94 for every round trip. Instead, the agency reported 2,960 one-way trips in July, 3,181 in August and 2,690 in September - which, unless things improve, puts it on a pace for an annual total of 35,324 rides. At that rate, the public subsidy would total $133 per trip, or $266 for every round trip. "We don't think it's useful to talk about (ridership) targets," says Ernest Sanchez, who manages the service for the Water Emergency Transportation Authority. "It's going to take a couple of years, and we are doing things to build service." That new ferry line to South San Francisco opened to a lot of fanfare, offering rides to and from Oakland and Alameda in less than 55 minutes. What's not being talked about is that for every $14 round-trip ticket sold, the public will be kicking in a subsidy of nearly $100. 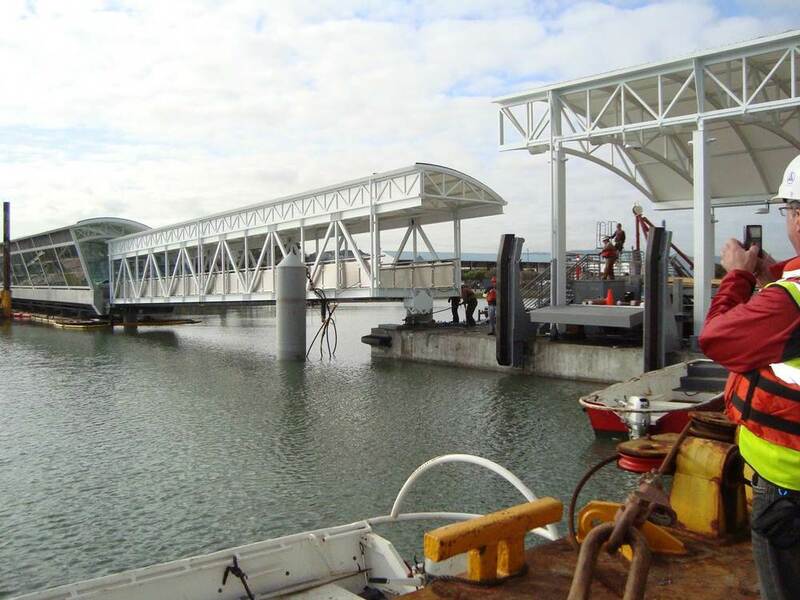 -- $26 million for the new Oyster Point ferry terminal, paid for largely with San Mateo County sales tax money. -- $16 million for two 140-seat ferries, paid for from Bay Area bridge tolls. -- And a $2.6 million annual operating subsidy, also paid from Bay Area bridge tolls. Add it all together and you get $94 million over two decades. At an estimated 100,000 riders annually, that comes out to a public subsidy of $47 per ride - or $94 for every round trip. Just to run the service next year - without taking into account any startup costs - the public subsidy is expected to total $26.60 per one-way ride. By comparison, the Water Emergency Transportation Authority expects 472,000 riders next year on its Alameda/Oakland to San Francisco ferry, with a subsidy of $8 per ride. For Golden Gate ferry service, which carries 2 million riders annually between San Francisco and Sausalito and Larkspur, the public subsidy amounts to about $15 per ride. "The question is, will (the South San Francisco ferry) pencil out on the ridership and financial side?" said spokesman Randy Rentschler of the Metropolitan Transportation Commission. "I think the jury is still out." Ernest Sanchez, manager of the water authority's new South City line, said the agency is counting on ridership growing - even if it can't say by how much. He says the spending is an investment in both the region's emergency preparedness and its congestion relief efforts. South San Francisco is also betting on the ferry service to spur development. That explains why biotech giant Genentech and other local companies - which together employ between 25,000 and 30,000 workers - campaigned for the sales tax increase to pay for the Oyster Point terminal. "There are space limitations out there, and it is difficult for them to keep building conventional parking spots and to jam people up at the freeway interchange," said Marty Van Duyn, an assistant city manager. What's more, local real estate interests are looking to build office parks on more than 70 acres around the terminal. In any event, says Rentschler, the ferry "is always going to be the Cadillac of service - you get tons of space to chill, and you can even have a beer on your way home, and it's always going to be subsidized."